My first teaching post took me to the very familiar territory of West Connemara and the majestic splendour of Kylemore Abbey. I had no car initially and this had an inevitable adverse impact on my hurling career. Tom Meehan, who was a driver for my father in his fruit business used to collect me on Fridays but all the training and a lot of matches were played midweek and I had to resign myself to playing with the juniors. By 1973 I was very much a permanent resident of West Connemara and immersed in the affairs of the newly established Connemara All Blacks Rugby Club. Over the next four years my sporting focus changed but my love of the camán remained undiminished and I often went for puck abouts at both the Ball Alley pitch in the town and at Woods which was over the Galway Road. Connamara Thiar Junior Hurlers pictured at Moycullen prior to the Annaghdown league encounter. Back Row (L to R): Br. Vivien Cotter, Tom Mannion (RIP), Dave Shaughnessy, Matt Sullivan, Mick Cummins, Christy Donovan, Tommy Mullen, Brendan Ridge, Marty Mullen, Brother Basil. Front Row (L to R): Frank Darcy, Peter Keane, Vinnie Keogh, Brother Baptist, Kieran Canavan, Seamus Vaughan, Joe Larkin, Pat Shanahan. Photo courtesy of Br. Vivian Cotter. 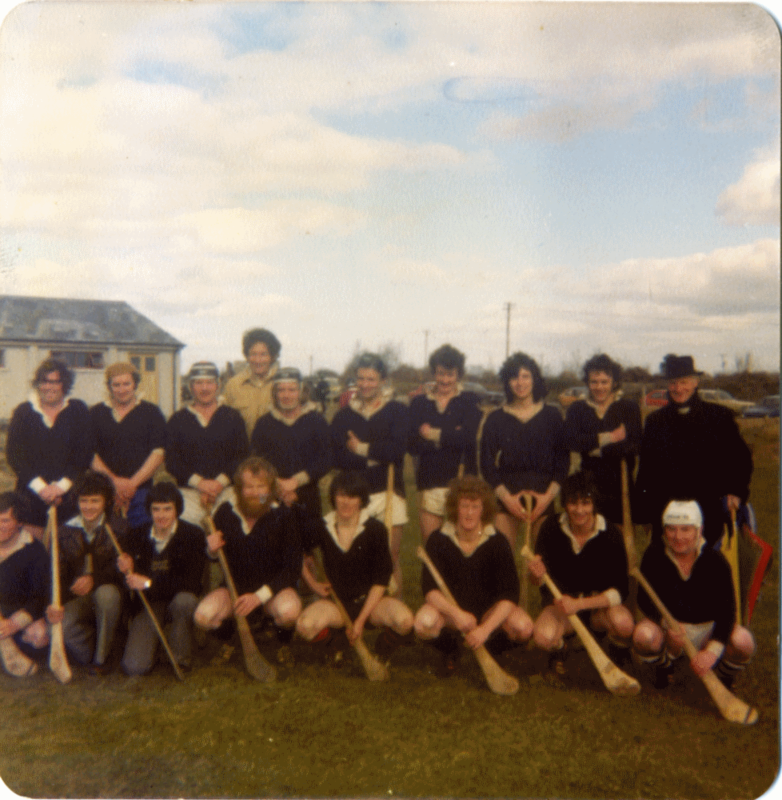 In 1977 a few of us decided to affiliate a West Connemara hurling club with the County Hurling Board. Brother Vivian Cotter, Tim Mulcahy from Bruff, Co. Limerick, Christy Donovan, a forester who had played for Laois, Joe Larkin, a Bank Official from Ballina, Matt Sullivan and myself were the main instigators of the project. Brother Viv had also played for the Limerick Minors. When he started his teaching career in Clifden Secondary School in 1968, he had hoped to introduce hurling into the PE Curriculum but there was no area, flat enough or long enough in the environs of the school, where one could develop skill levels among interested students. Nine years later he still had a tea chest full of hurleys which he wanted to put to good use and we were more than happy to adhere to his wishes. The word was spread, and a general informal meeting was called at which an Executive Committee was elected and an official name, ‘’Conamara Thiar’’, chosen for our fledgling new club. A motley crew turned out for training which included Frank Darcy, Marty Mullen, Kieran Canavan, John Coneys, Seamus Vaughan, Peter Fitz, Michael Sugrue, Tom Mullen, Gerry O’Brien, Eamon O’Loughlin, Jim Mullen, Billy Gilmore, Steven Flaherty, Johnny O’Malley and Pat Shanahan. Coaching was of a general nature, with those of us that had previous experience demonstrating the various hurling skills to our panel of players. There were no selectors required because generally we had just about enough players to fulfill each fixture and there were usually a few interested spectators who would come along for the craic. The central axis of the team was solid enough but we didn’t have any strength in depth. In reality there was only about six or seven of us who would hold our own on an average junior team. We didn’t always have the same players available either, because a good few of the lads played Gaelic football and as a consequence of this we were never able to properly establish any kind of settled playing system. We had a good relationship with the local Gaelic football clubs but there was always an understanding that in the event of a clash of fixtures, they got first call on the dual players. Conamara Thiar hurlers made their competitive debut on the Carnmore pitch against Beagh. The South Galway men wore black jerseys with an amber stripe and we were geared out in the black jerseys and shorts of the Connemara Rugby club, so they were very wary of us. For the first few minutes we hurled like men possessed, pulling on every ball as if our lives depended on it. Our frenetic approach completely bamboozled the Beagh lads, until it suddenly dawned on them that we weren’t really up to much and they duly proceeded to wallop us thereafter. We managed to score two points. Brother Viv pulled off a number of miraculous saves in the goal but the magic moment of the match for me was provided by a Beagh player of tender age who killed one of Viv’s puckouts on the bos of his hurl before returning it promptly and with unerring accuracy over the bar. During the half time interval, Peter Fitzpatrick produced a couple of bottles of tonic water which were passed around. After we had consumed a few badly needed gulps Peter, who had a great sense of humour made the following comment, “aah boys, there’ll be hard hurling in the second half after all the poteen.” When the match was over the Beagh team sportingly commended us on our endeavour and commitment and reassured us that if we stuck at it for a few years we’d definitely enjoy some success. Remembered by Mick Cummins and written by Paul Gannon. Mick Cummins is a permanent resident of the townland of Baunogues, in the Parish of Letterfrack-Ballinakill.